A judge agreed to release Terry Bryant without bail. His attorney calls a felony grand theft charge excessive. 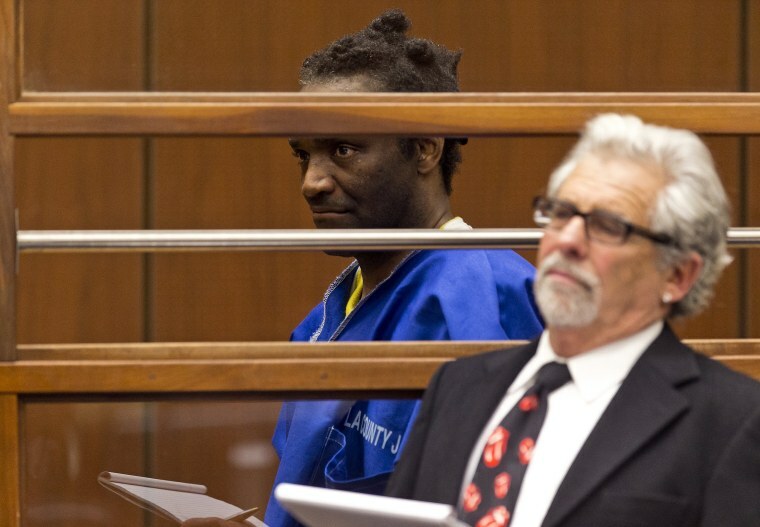 LOS ANGELES — A judge on Wednesday agreed to release without bail the man accused of stealing Frances McDormand's Academy Award, while his attorney vowed to fight a felony grand theft charge he says is excessive and undeserved. Terry Bryant, 47, who has been jailed since his Sunday night arrest, appeared behind glass in the courtroom in a blue jail jumpsuit and pleaded not guilty. His attorney Daniel Brookman had argued that the previous bail amount of $20,000 was unnecessary, calling the Oscar situation a momentary aberration. He said Bryant has had no contact with law enforcement for six years and represented no threat to the community. Los Angeles County Superior Court Judge Deborah S. Brazil said she was concerned by Bryant's four prior felony convictions on theft-related charges and his past failures to appear in court, which prosecutors argued should keep the bail unchanged. But Brazil agreed that several years of good behavior and the lack of a threat to the community justified Bryant's release. Brookman acknowledged that Bryant can be seen on an Associated Press video holding McDormand's best actress statuette but said those images don't rise to the seriousness of felony grand theft. "There's a big difference between holding an Oscar and what he's charged with," Brookman said outside court. "I don't think his character matches these charges." Bryant walked out of the Governors Ball Oscars after-party with the trophy on Sunday night, authorities said. He was captured on the AP video holding it proudly over his head and saying, "All right baby boys and baby girls." He quickly gave it up when confronted by a photographer, police said. AP footage from earlier Sunday shows Bryant walked into the Governors Ball alongside McDormand, although there is no indication they knew each other. McDormand smiled and laughed as she entered the party and her son carried her Oscar into the party, the footage shows. Brookman said Bryant, whose social media pages are full of pictures of him on the red carpets of awards shows and Hollywood premieres, goes to the events because he considers himself an amateur journalist and is seeking to be a professional one. He would not say how Bryant is able to get into such elite and secure places, or how he got a ticket to the exclusive Governors Ball, which police said he had. McDormand won the Oscar, her second, for her performance in "Three Billboards Outside Ebbing, Missouri." Brookman said he intends to reach out to McDormand to see if she'll provide help and perhaps tell authorities she doesn't want his client prosecuted. Brookman said the grand theft charge isn't justified for swiping an Oscar because their despite their cultural value, street value is very limited by the fact that the film academy keeps a stake in their ownership and controls how they can be used. "They're very difficult to pawn or sell," Brookman said. Bryant could get three years in jail if convicted. Naomi Levy, a rabbi who came to court to support Bryant, said he is part of her spiritual congregation and never misses meeting. "He's a sweet and gentle man of faith," Levy said. Brookman cited her presence in court when he asked for Bryant's release, saying she could attest to the special role he played as part of her community. The judge said that influenced her decision to release Bryant on his own recognizance. "What can I say," Levy said as she walked out of the courtroom. "I take care of my flock."